While the functionality of electronic medical equipment is of the utmost importance to manufacturers, it is also necessary to consider the experience of patients using the equipment. Noisy medical devices can have a negative impact on the patient's quality of life. A manufacturer approached Polymer Technologies because their oxygen concentrator produced too much noise during operation. They expressed their need to reduce noise in existing models because developing a redesign of the product’s exterior wasn’t feasible. We worked with them to devise the best solution to absorb sound waves and increase patient comfort by thinking forward with an innovative material solution. When the manufacturer contacted Polymer, they had just completed the design and build of their first production models of the oxygen concentrator. The manufacturer was concerned about the feedback the units received. Patients disliked how loud the oxygen concentrator was during operation, which severely impacted user experience as patients often have their device with them throughout the day. Noise was a primary concern for the manufacturer, and not only because users were unhappy with its performance. They were up against tough noise reduction requirements. 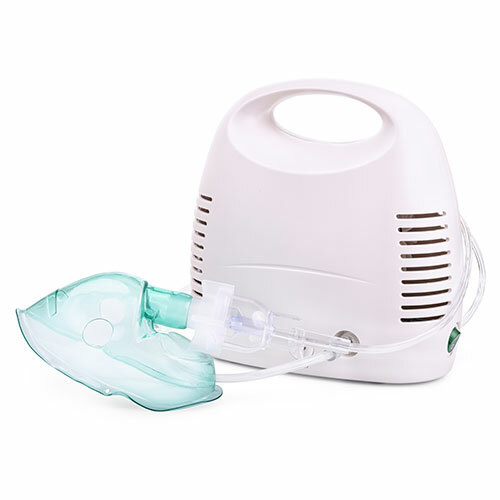 While the manufacturer was located in the United States, they planned to distribute to the European Union, which has stricter requirements for noise levels emanating from devices such as oxygen concentrators. Since the oxygen concentrator was already a finished product, the tools for developing the unit were already designed. A redesign of the unit was not an option, so this gave us a specific direction and a set of restrictions to think inside the box to find the best solution. A custom molded foam was chosen to simplify the assembly of the product and improve the quality of the damping effect. Molded polyurethane foam is ideal for reducing sound and filling space inside of devices with soft material. We were able to develop a two-piece mold out of POLYFORM® High Density Non-Skinned foam that absorbed noise and reduced the number of parts. The manufacturer was able to replace multiple expensive mountings and airflow brackets inside the oxygen concentrators with the two pieces of molded foam, as well as drastically reducing production cost and assembly time. The two molded foam pieces fit perfectly into the side of the oxygen concentrator and were specifically designed to allow air to pass through, creating a snake-like path that produced minimal noise. Our solution successfully met the goals of the project. The 3D foam solution reduced the decibel level of the oxygen concentrator significantly, which resulted in a better experience for the end user and passed EU requirements. The molded foam solution also provided additional cost savings. The brackets previously used by the manufacturer were of a medical grade stainless material that was very expensive, so the molded foam solution significantly reduced the cost of production and improved assembly time for the manufacturer. Since the solution was designed to work within the existing design of the oxygen concentrator, the manufacturer did not have to spend significant resources redesigning the unit and the tools required for its production. Finally, the solution was implemented within the timeframe outlined by the manufacturer, enabling them to address the concerns of the end user as soon as possible. Thanks to our in-house production and helpful design team, we are still partners with the manufacturer, and they turn to us when they need to develop updated iterations of their oxygen concentrator and new products. When designers consider molded foam products at the beginning of a project, OEMs can design streamlined assembly processes that also increase noise reduction, improve assembly time, and reduce the number of parts required. If the possibilities of a molded solution excite you, then be bold and develop your own custom mold with us, the experts at PTI.